This antibody reacts with human, mouse, and rat smooth muscle myosin heavy chain 11 (SM2). Does not cross-react with smooth muscle Myosin heavy chain 1. Synthetic peptide corresponding to Human smooth muscle Myosin heavy chain 11. The immunogen sequence exists in isoforms 3 and 4 but not isoforms 1 and 2 of the UniProt record P35749. Our Abpromise guarantee covers the use of ab683 in the following tested applications. IHC-P 1/400. For paraffin embedded sections, Carnoy's fixative may give better results than formalin. 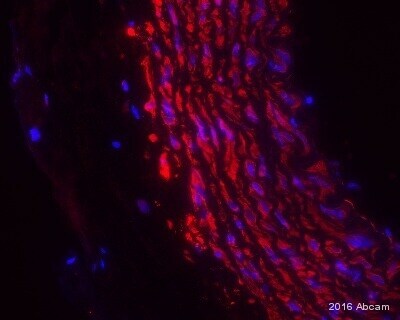 ab683 at 1/400 staining rabbit oesophagus tissue sections by IHC-Fr. The tissue sections were paraformaldehyde fixed and blocked with serum prior to incubation with the antibody for 1 hour. An Alexa Fluor® 594 conjugated goat anti-mouse IgG1 was used as the secondary. ab683 staining smooth muscle Myosin heavy chain 11 in rat cells from cells from mesenteric artery by ICC/IF. Cells were PFA fixed and permeabilized in 0.3% Triton X-100 prior to blocking in 2% serum for 30 minutes at 20°C. The primary antibody was diluted 1/300 and incubated with the sample for 14 hours at 4°C. Alexa Fluor® 488 chicken polyclonal to mouse Ig, diluted 1/400, was used as the secondary. Nuclei stained with Hoechst 33342.
ab683 staining smooth muscle Myosin heavy chain 11 in human cerebral artery tissue sections by Immunohistochemistry (IHC-P - Formalin/PFA-fixed, paraffin-embedded sections). Tissue was fixed with formaldehyde, permeabilized with 0.3% Triton-X and blocked with 5% serum for 1 hour at 25°C; antigen retrieval was by heat mediation in sodium citrate. Samples were incubated with the primary antibody (1/500) for 16 hours at 4°C. A biotin-conjugated rabbit anti-mouse IgG polyclonal (1/300) was used as the secondary antibody. ab683 staining smooth muscle Myosin heavy chain in human freshly isolated arterial myocyte by ICC/IF (Immunocytochemistry/immunofluorescence). Cells were fixed with paraformaldehyde, permeabilized with 0.3% Triton X-100 and blocked with 2% BSA for 30 minutes at 20°C. Samples were incubated with the primary antibody (1/300 in PBS) for 14 hours at 4°C. An Alexa Fluor® 488-conjugated chicken anti-mouse IgG polyclonal (1/400) was used as the secondary antibody. Looking for an antibody that will recognize smotth muscle heavy chain 1 &2. One customer ordered the antibody ab683, smooth muscle myosin heavy chain 11. In response they had a request do you know which isoform is recognized by product AB683? SM1A, SM1B, SM2A or SM2B? Do you have other antibodies available for the detection of this MYH11 gene, do they recognize a certain specific area of SM1A, SM1B, SM2A or SM2B isoform? It will not recognize SM1A or SM1B, but it cannot distinguish between the A and B isoforms of SM2. For an antibody specific for SM1, we have ab682. This will not react with SM2, but it cannot distinguish between the A and B isoforms of SM1. 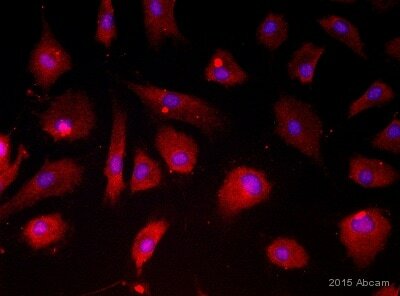 We have tried this antibody with human smooth muscle cells and it did not work. We would appreciate Abcam supplying us with the replacement antibody ab53219. This antibody has not been tested with human cells but we are prepared to try it with our cells and report back the activity. Yes, I'd be happy to replace ab683 with ab53219 (which is also an Anti-smooth muscle Myosin heavy chain 11 antibody). Since this antibody has not been tested in human samples, we would not be able to guarantee it for human samples. Thus, the Abpromise guarantee would not apply. However, I can issue a testing discount code for the customer. For more details on this offer, please see below. Please let me know if the customer would like to receive the testing discount code. Est il possible de connaître leur concentration SVP ? Les anticorps ab682 et ab683 ne sont pas purifié et donc la concentration n’a pas été déterminée. Ces anticorps sont des ascites et nous estimons les concentrations d’être entre 5-10 mg/ml. Could you recomend IHC-P protcol for ab683? Please find attached protocol for ab7817.